Let me show you step by step how to make a pumpkin fairy house craft for Halloween. 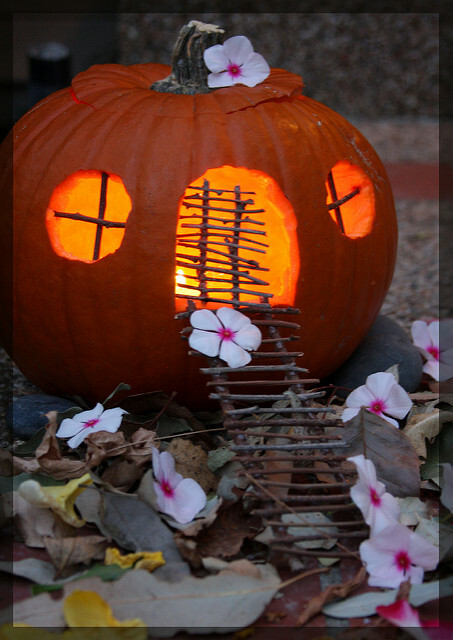 Carving a cute fairytale home from a pumpkin is quite easy to do and looks so effective for a fantasy theme. This year I wanted a fantasy theme for my pumpkin decoration so I carved and decorated a design that any one into Harry Potter, Hobbits and Lord of the Rings is sure to love. There are loads of photographs to take you through how I made this design from hollowing the pumpkin out to carving it and decorating. Included are lots of tips on getting the complete fantasy look that was wanted too. Step 1: Start by hollowing out your pumpkin. For this pumpkin carving fairy house, it is important that you cut off a lid top for the pumpkin before you start to hollow it out. The lid forms the roof of the fairy home when completed so it needs to be in one complete piece. A large lid will look better than a very tiny one. The tutorial linked to above explains how to remove the lid. A non permanent marker pen allows you to draw out a rough design for your fairy house before you start carving it. Red is a great color because it is dark enough for you to see but not too dark that it will mark the finished design. Either way, you should be able to rub any lines off when you're done. Start by drawing out a rough round door shape bottom middle of your pumpkin. Either side of the door draw out two large windows. I made round windows with thick cross bars in the middle. Step 2: Carefully cut out the window sections. I used a small, sharp knife which is what I'm used to using but you may want to use special pumpkin carving tools instead. An easier version is to simply cut out circles for the windows but this won't look as good when the pumpkin is lit up from the inside. So I cut out quarter circles to give the appearance of having bars between. You need to cut right through the flesh. If you've never cut designs into a pumpkin before, I'd urge you to practice on one first because it is very easy to make mistakes, even when following the lines you've marked out with a pen. Step 3: This photo now shows the completed windows which have been carved on either side of the door. You can rub away the pen markings from around the windows once they are complete. To make the door, I completely cut out a large oval shape. You need this section to be cut whole so that you can prop it up against the finished fairy pumpkin and give it the look of steps climbing up into the house. This door section is attached using toothpicks which have been cut down in half or smaller. Stick them into the bottom of the open door and then fasten on the door section so it is pressed down over the sharp ended picks. For now, you can either draw or carve some lines to give the look of steps running across horizontally on the oval door section. I only carved down to the white pith of the fruit. I did this by scoring out the lines with a sharp knife and then carefully peeling away the top orange layer of skin to reveal the pith. Once done, move this out of the way until later. Step 4: I drew some detail around the fairy door area with a non permanent marker pen. I decided to carve into this but it is fiddly and you may wish to decorate some other way. Options can include drawing over the detail with a Sharpie, a metallic pen, glitter glue or gluing sequins around it. You could also use push pins. Step 5: This photo shows the detail area I carved out around the fairy door. This was fiddly to do but I knew it would look good when the pumpkin was lit up. You can make this easier by either decorating the pattern using the suggestions in step 4 or just cutting down into the white pith instead of cutting all the way through. Once I cut around the door area, I needed to push wooden toothpicks through between the door and the rest of the pumpkin to hold that in place well. You can just about see some of the wooden pick on the right side if the door frame. Toothpicks are very handy for securing sections of your carved pumpkin. Step 6: Once you have all the main parts carved out that you want (and you can add much more than I have) then you can start drawing on some detail. I start by sketching out the design I want using a non permanent marker pen and then when happy, I go over the lines with a black Sharpie marker. I drew out a spiderweb pattern all over the pumpkin lid and then added in some swirls and a hanging lantern design for detail. These parts will look good during the day but will not show up well when the pumpkin is in the dark. It helps to have a good combination of sections that are cut and will allow the candle light through and sections that look good during daylight. Step 7: More detail has been added using Sharpie marker pens. I drew around the door frame and inside the windows to give the look of wood. Glitter has been added with Stickles glitter glue. Stickles is the best quality glitter glue that I have ever used. It has a fine nib for application and really sparkles much better than cheaper glitter glues do - and I've tested out a lot over the years. This is what mine looked like when it was lit up from the inside with a tealight candle. You can use flameless candles if you are concerned about safety. You can see how all the carved sections are nicely lit up with a yellow glow. The glitter looked really good in real life and was picked up by the candlelight. You cannot appreciate that so well with a photo. This is a simpler fairy home design which features easy to carve round windows and a curved door. These have been inset with little twigs which adds some brilliant detailing and looks fantastically cute. I hope you enjoyed the inspiration for making your own magical little home today.